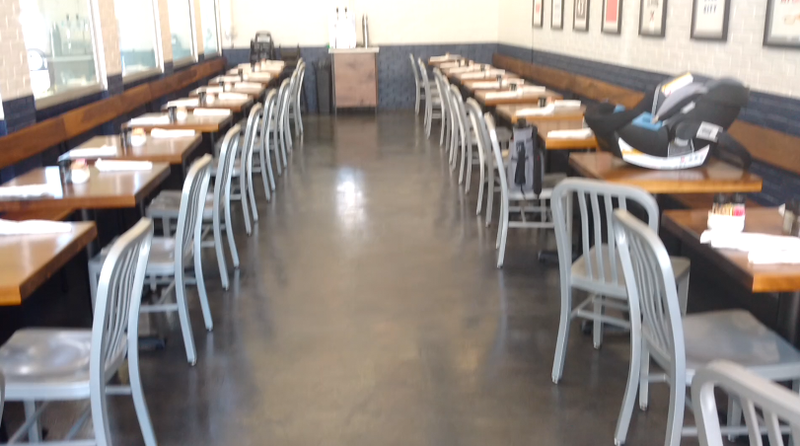 This concrete overlay floor was provided for Karl and Sarah Worley the owners of the Biscuit Love chain of southern cuisine restaurants. Part of the original floor was actually an outside aggregate sidewalk and an aggregate porch. We spent days grinding, patching and levelling this floor. We then applied two coats of EliteCrete overlay product called ThinFinish. Thin finish is a cementitious product that is about 5,000 psi. So it’s actually stronger than the originally poured concrete slab. After we applied the overlay our crew hand trowelled a micro topping on top of the thin finish. After we applied the new concrete overlay we allowed it and the micro topping to cure for a day. We then took a charcoal acetone dye and diluted it with four parts of acetone to one part dye and sprayed the color over the new flooring system. This porduced the beautiful marbling color that you see on the floor. Cementitious overlayments consist of three completely different pre-packaged products. Each of these products are actually referred to as; polymer modified, cementitious overlays. Although there are only three products in this category, the uses and versatility of these products covers a very wide range of applications. Acid Stains, water based stains, dyes and cement colors come in a wide array of choices and even a large array of uses. We can help you select the right color application for your project.